Ecofest 2017 – We’re Blazing a Trail! EcoFest 2017 was all about area kids “Blazing a Trail” at the site of Dani’s Dreams Outdoor Education Trail at Sugar Creek Park in New Palestine. Hands-on adventures – from meeting crooked leg turtle, creating crafts, to eating bugs were the order of the day. NPHS teacher Brittany Bennett and her students ran the show. Trail signs are going in this summer and Dani’s Dreams will continue to develop activities and a place for Southern Hancock families to share an interest and love of our common ground. Support these community activities through your registration for the 10th Annual Dani’s Dreams Memorial Walk/Run Aug. 5 at NPHS. Click here to sign-up or donate! The seeds of Dani’s Dreams, planted more than eight years ago, have been carefully and lovingly tended by family, friends, Zion Lutheran Church and School and the Southern Hancock community. With your support, Dani’s Dreams is “Spreading Our Wings” and empowering young people of all ages to create, explore and discover! Join Dani’s Dreams team by volunteering – come to the Jan. 22 “Sharing Meeting” to find out how. Our membership campaign begins Feb. 3, 2016 with the Children’s Museum Night at the Zion Lutheran School gym. More information to come. Trail at Sugar Creek Park. Initial plans were announced Nov. 4 at the Dani’s Dreams Family Tree Day event at Sugar Creek Park. New Palestine High School AP environmental science students shared the beauty of fall and innovative plans for outdoor education at Family Tree Day at Sugar Creek Park Wednesday, Nov. 4, 4-5:30 p.m. They led community members of all ages in fun, outdoor education activities unveiled plans for “Our Common Ground.” Contact Donna Griffin at dgriffins96@gmail.com for more information. Stay connected here and the Dani’s Dreams Outdoor Education Center Facebook Page for more details. 3. Zion Lutheran School Second Graders take the lead with Butterflies UPCLOSE! They flitted, they flew, and they soared – Monarchs and kids alike – at the Butterflies UPCLOSE event at Dani’s Dreams Outdoor Education Center at Zion Lutheran School. More than 100 kids, parents and butterflies celebrated the joy of nature and God’s creation, led by teacher Brenda Kreutz and her second graders who were the tour guides for the butterfly house. The 14 students spent the last six weeks learning about the life cycle of a Monarch by growing close to 30-40 caterpillars, observing and recording the process in reports they shared with those in attendance. They worked with Betty Bemis of Backyard Butterflies who provided the caterpillars and her expert advice. The New Palestine community joined forces to support this innovative STEM educational event for area children. Willing Hands Entertainment provided face painting, New Palestine High School environmental education students and teacher Brittany Bennett helped with Monarch tagging and event organization. Dani’s Dreams thanks all those who attended for making the day so special and being active participants in creating, exploring and discovering! 4. We’re racing to Change the World in Southern Hancock County! 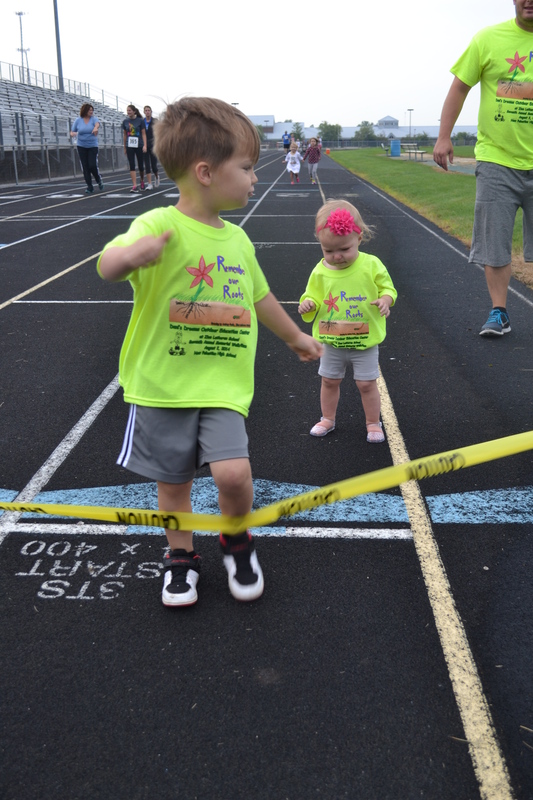 The Southern Hancock Community showed up in force Aug. 1 to “Change the World!” at the eighth annual Dani’s Dreams Memorial Walk/Run at New Palestine High School. Nearly 150 walkers/runners of all ages took to the track/course, and more than $2,800 was raised to support Dani’s Dreams events. Thanks to all those who attended and supported Dani’s Dreams Outdoor Education Center, including our sponsors, Noll Landscape Group, Inc., Hillcrest Tree Farm – Randy Caster, Team Image Screenprint and Embroidery, Thrivent Financial for Lutherans – DeLane W. Sayler, Dr. Sharon Paluga – New Palestine Gentle Dentist, K&K Fence, McDonald’s of New Palestine, Greenfield Walmart, Mama Nita’s Pizza, Auto Air and Heating, Dr. Colleen Pool Family Dentistry, C.D.’s Music Factory, Rose Ivy, LLC; Hancock Family Physicians – New Palestine Family Medicine, Backyard Butterflies and Frady’s Lawn & Landscape; our race participant groups: NP Sole Sisters, the NPHS Girls Soccer Team, the NPHS Volleyball Team, members of Zion Lutheran Church and School and Dani Griffin’s family. The 2015 winner of the Dani’s Dreams Walk/Run was Rick Sica with a time of 18:55. The women’s winner was Grace Voelz with a time of 22:00. T-shirt design contest winners were honored at a pre-race ceremony: Kate Taylor, first place; Katie McKinley, second place and Paige Taylor, third place. The 2015 Dani Griffin Innovation in Education Memorial Scholarship winner is Benton Turner, 2015 graduate and valedictorian of Lutheran High School, but he was not chosen for his impressive academic accomplishments, but for the power and passion that drives him in his future career path. Benton, the son of Tracy and James Turner, Greenfield received an Indiana Core 40 Academic Honors Diploma. At Lutheran High School, he was involved in the Academic Super Bowl, Spell Bowl, National Honor Society, Indiana State House Ambassador, varsity golf, Voice of Democracy State Finalist, United States Senate Youth Program State Finalist, Spanish Club and Student Council. He worked in the community for Zion Lutheran Church and School, of which he is a member, and as special projects coordinator at The Sharing Place of Greater Indianapolis. He will attend DePauw University and major in biology. 6. Grandkids, grandparents step up to the Earth Day Challenge at Dani’s Dreams! For the fifth year, Dani’s Dreams Outdoor Education Center sponsored family activities for Southern Hancock children by bringing the Children’s Museum to Zion Lutheran School Feb. 11, 6-8 p.m.
Special activities and exhibits allowed students to discover the physics of flight. Families worked together to create a model aircraft, test flight dynamics, and explore air using a wind tunnel. This event kicked off the year’s activities for Dani’s Dreams…and Changed the World in 2015!